and I'm not sure how to address it properly. I've been looking for some tips on the Internet, but they're all about postcards without lines, so you can just turn them and treat like a "normal" ones. Presuming you actually want the postcard to arrive, I'd suggest putting it in an envelope and addressing as per a normal envelope. It will depend on the specific countries, but as shown (ie, vertical) that is NOT a valid postcard/letter as far as USPS is concerned, and at a minimum that would impact the postage due for it - if it could even be posted at all. I suspect many other countries post offices will be the same. There's also a high risk of it getting lost/mis-sorted by the automated sorting machines used by most countries as they will probably not be able to correct detect the address. A. 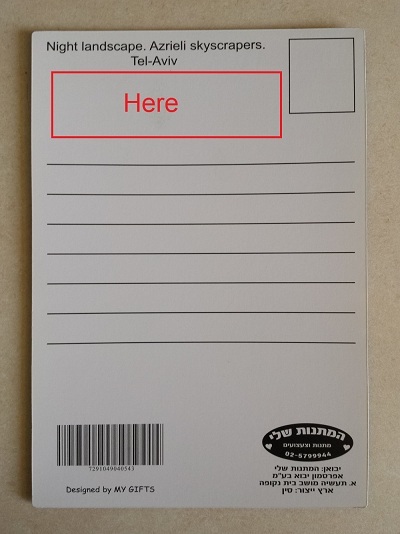 You can turn it into a blank horizontal postcard by taking a blank white sticker and putting it on the lines. B. Put the address in such a way that it's distinct from the content. Remember that after all the people that handle the mail are people, they can process mail that doesn't fall exactly into predefined templates, but they will not get out of their way to understand what you meant. So as long as you differentiate between the address and the message in a clear way, you will be fine. Horizontal postcard differentiate between the address and the message with a line, and the address is usually on the same side as the stamp, so I would recommend putting the address in the blank space above the lines, and putting a big line that will separate it from the message. Not the answer you're looking for? Browse other questions tagged israel mail souvenirs or ask your own question. 2FABE - the 'secret' international travel postcard stamp code? Can I receive a parcel in Norway without an address? How can I send a postcard from Singapore to India? Buy and send postcard from Toluca, Mexico? UK address: district or county? What language should I address a letter?